Are you looking for the ideal printing or mounting options for your favourite photo? Our sample packs make your choice easy! Order your WhiteWall Sample Pack now - shipping is free! A promo code for €10 off your first order is included in the price of €9.95. You can find the code right on the delivery slip. Want an overview of our extensive range of products? Then this Sample Pack is the right choice for you! 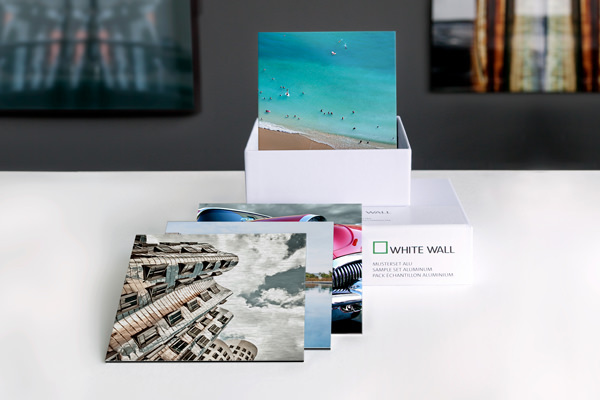 You receive samples of our most popular products spanning different categories, from our acrylic bestseller to various aluminium Dibond products to canvas and Hahnemühle prints. Discover the perfect material for your photo and experience the quality of our photo products firsthand! Discover the features of glossy or matte acrylic glass: your photos will have a subtle effect of depth and intensified color. For maximum sharpness: our award-winning, crystal-clear ultraHD Print Under Acrylic Glass is also included in the sample pack. Are you looking for a robust material with a modern appeal? Our direct print on aluminium Dibond can even be hung outdoors. Get the feel of the ultra-thin HD Metal Prints and convince yourself of the quality of the photo print on aluminium Dibond. Do you use exclusively high-end photo paper as a professional photographer? We develop your photos with state-of-the-art laser technology and traditional photochemical laboratory expertise. You will also see our Fine Art prints on precious Hahnemühle paper. There are no words or logos on the product samples. That’s perfect for me as a photographer because I can use them to help my clients find the perfect product to suit their needs. The right photo printing options can determine whether or not a picture achieves its full potential. But how can you get a feel for the appearance, surface, and texture of the products before placing an order? With our Sample Packs for each product category! No matter if you want an Acrylic Print, Metal Print, or simple photo prints, you can form a solid impression of how your picture will look and feel before placing an order. 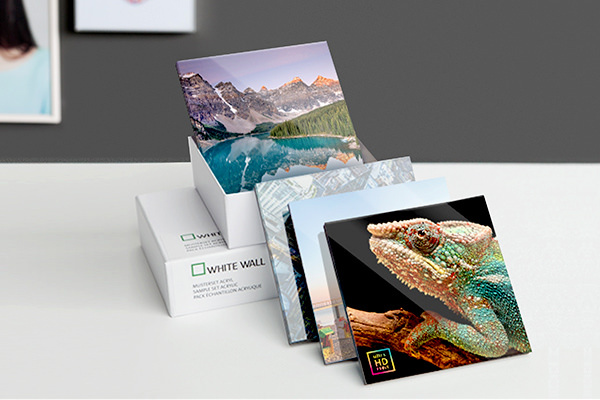 These are also a great way for professional photographers to present printing options to their clients. After the big day and the excitement of the ceremony, Dennis Heck talks to the happy couple about which photo paper would be best for which shots. “It makes a massive difference if you use Fuji Crystal DP II in matte or silk. 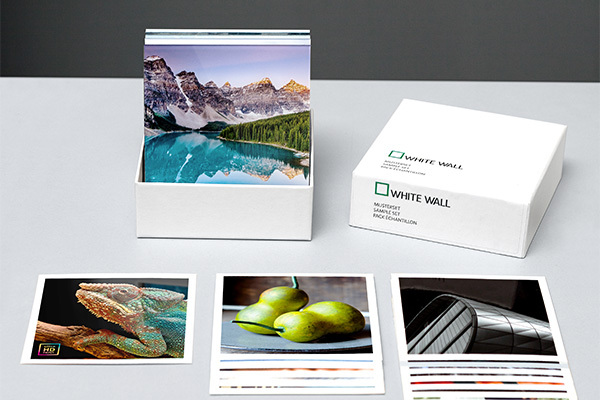 Most of the time, the couples aren’t aware of the subtle differences.” The WhiteWall Sample Pack contains 15 high-quality photo papers with different finishes that lets Heck’s customers make their own very informed decisions. For a modern look or for certain weather conditions, Dennis Heck prefers aluminium mounting. “When one of my customers was redoing a balcony, she wanted to hang a large-format picture of her wedding reception there. I advised her to try a weather-resistant HD Metal Print,” Heck explains. The piece is resistant to water and changes in the weather. 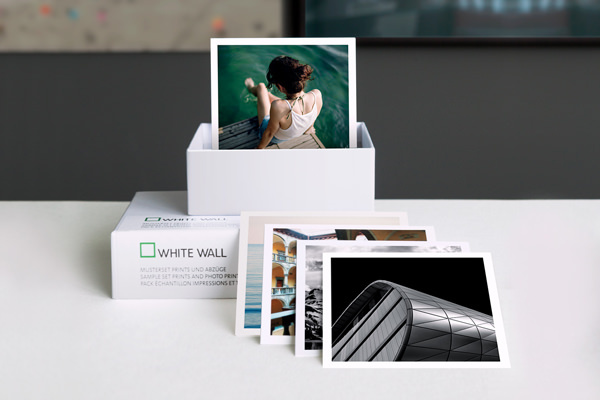 The shipping for the Sample Packs is free, and the price tag of €9.95 also gets you a €10 WhiteWall Gift Certificate, making the Sample Pack effectively free!